So after watching two episodes of Fist of the North Star and a peanut butter twix; I decided to shave the beard I grew while watching the manliest anime and make some Cookies. First of, when you’ve got all of your ingredients and utensils out, smack that oven on for 190C. 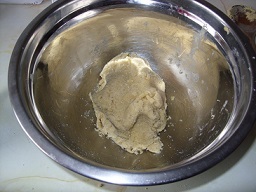 Then you can start with the dough/mix. 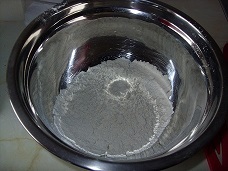 Get your flour and give it a cheeky sieving into the bowl; making sure all, or at least most of it, gets into your bowl or giant cup or bath tub. It all depends on how big/how many you’re making or what you have at hand when you make these. 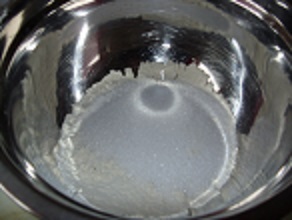 Measure your sugar out, sugar. And, honestly, chuck it right on in there. Right on top of that flour, flour…what? Anyway…NEXT STEP! Butter should be at room temperature…it just makes it easier. Get that 100G and cube it; for no other reason other than it makes the whole process easier, which is what you if you just want to make biscuits. Chuck it in with the flour and sugar; have to mix it together so it almost resembles bread crumbs (If the bread was quadruple the size of the average loaf (this may be exaggerated)). Wondering now if I could have used a potato masher, what do you guys think? Once all that is done. Crack an egg into whatever you can crack an egg into. 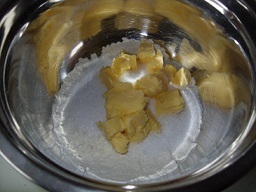 Beat it up nice and lightly and add it, a bit at a time, to mix the mega crumbs together into a stiff-ish dough. 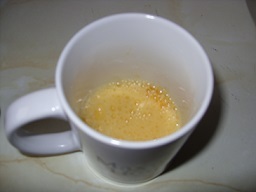 You want to be adding enough egg into the mix to that it actually combines (that’s why it says ‘1-2 eggs’ just in case 1 isn’t enough). You can do whatever you want with the doughy mix after that, but, would be advisable to start shaping them. To make some dough balls, you should get your hand a little moist and pass them about between the palms of your hands. 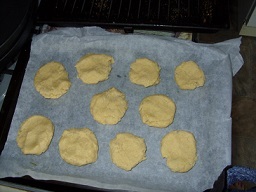 Them, once they’re ball shaped get them on the tray and press them down into something along the lines of a disc. Your ball discs don’t have to be perfect, but if you want them perfect; get a cookie cutter ring, put the ball in the middle and press on it till it forms the same shape as the cutter. Once you do get them into disc-like-balls; get your thumb or end of the wooded spoon you didn’t see till things were already mixed together and give your discs a little indent in the middle. When you’ve finished your indenting it’s time to bring out the jam. 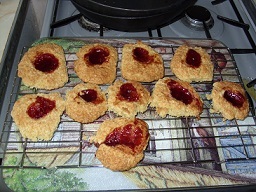 Get which ever sized spoon you want, (depends on the size, I guess), and spoon in some of your jam into the middle of the biscuit/cookies. After that, apologize to your oven, explain that you didn’t forget about him/her/Mildred, get the tray with the biscuit/cookies on and slide them in for about 15-25 minutes. 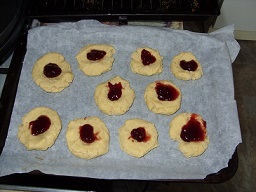 Once they’re done and the jam has stopped bubbling, take them off the tray and ever so gently place them on a wire rack to cool. Once they’ve cooled, you can them eat them all…or share them around; that works too. Hope you enjoyed my little recipe thing (which is strange, considering this started as a review site (which it still is)). I will cook again sometime soon and the recipe will go up for people who actually read my Blog or the people who just want to dabble in deliciousness. Like, Comment, Follow. and I shall see you next time. Byee Byee :D.